Colombian Miguel Angel Rodriguez overcame local hope Alfredo Avila 11-8, 11-6, 13-11 in the Men’s Singles final to win his fourth successive PanAm squash title. 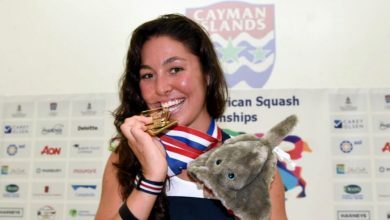 The 28-year-old Colombian went on to claim a second gold after partnering Catalina Pelaez to success in the Mixed Doubles – where the pair (both pictured above) beat Maria Elena Ubina & Chris Hanson of the USA in the final. Mexico’s first gold came in the Women’s Singles, courtesy of the country’s highest-ever ranked player Samantha Teran. The former world No11 from Mexico City claimed a remarkable seventh PanAm title triumph after beating top-seeded Canadian Samantha Cornett 9-11, 11-4, 11-8, 11-3 in the final. “I am very happy for the win,” said the 33-year-old Mexican star (pictured above at the medal ceremony). 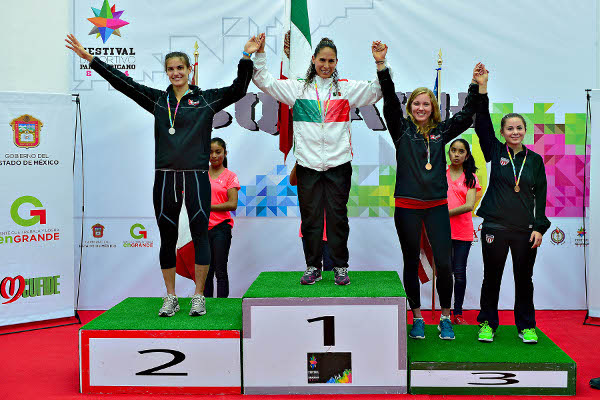 “After being injured, it was very difficult to get back – but it was important because the event was in Mexico, and the competition was very tough due to the qualification process for the 2015 Pan Am Games. A second gold came Mexico’s way when second seeds Karla Urrutia & Nayelly Hernandez beat Colombians Karol Gonzalez & Laura Tovar 4-11, 11-5, 11-7 in the Women’s Doubles Final. A final between the top two seeded pairings in the Men’s Doubles produced Argentina’s sole gold when favouritesLeandro Romiglio & Robertino Pezzota defeated Mexicans Arturo Salazar & Eric Galvez 11-9, 8-11, 11-6. USA fulfilled their seeding in the Women’s Team Championship, beating third seeds Canada 2/1 in the final. Canada denied second seeds Mexico a place in the final after a 2/0 upset in the semis – with Samantha Cornett gaining revenge over fellow ‘Sam’ Teran in four games. “We knew the tie versus Canada would be tough,” said USA’s Gilly Lane. “Sabrina got off to a great start with an upset win over Samantha Cornett, one of the strongest players in the tournament. Nikki took the next match for Canada. Then, Olivia demonstrated great professionalism and defeated Danielle Letourneau, who is a player that is really improving right now. It was in the Men’s Team event that Mexico clinched their third gold medal, the No2 seeds beating surprise finalists Canada, 3/4 seeds, 2/0 in the final. Serna was also the Tournament Chairman. “We were glad to see the biggest Panamerican Championship ever hosted in Mexico, and pleased to welcome new Caribbean entries – St. Vincent and the Grenadines and Trinidad and Tobago.